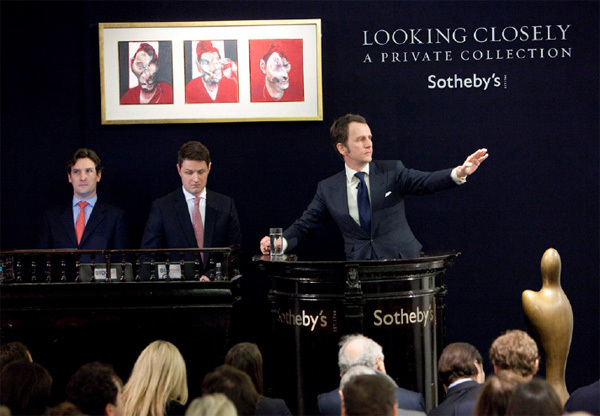 LONDON, THURSDAY, FEBRUARY 10, 2011 – Tonight, Sotheby’s single-owner sale of Modern and Contemporary art, Looking Closely: A Private Collection, was held in a charged saleroom where even attendees with seats were upstanding for some of the intense bidding battles that ensued. The top lot of the night was Francis Bacon’s extremely rare triptych of Lucian Freud which was contested by no fewer than ten bidders until it tripled its pre-sale low estimate and finally sold to an anonymous bidder in the saleroom for £23,001,250 / $37,004,411 / €27,129,930 (pre-sale est. £7-9 million). The second-highest price of the night was for Salvador Dalí’s Portrait de Paul Eluard, which was fiercely pursued by no fewer than nine prospective buyers, tripling the record established for the artist only last night in London (£4.1m) and continuing to escalate beyond that to achieve a world record price for the artist and any surrealist work of art at auction. An anonymous bidder on the phone finally won it for £13,481,250 / $21,688,635 / €15,901,108 (pre-sale est. £3.5—5m). The sale saw four new records set for artists at auction, with more than one record twice broken for the same artist. The exceptional selection of works which represent the finest examples of works by modern and contemporary masters reached a total of £93,520,600 / $150,455,941 / €110,307,368, above the pre-sale estimate of £39,298,000 – 54,987,000. The sale was 100% sold by lot – a ‘white glove’ sale – and 100% sold by value. At the end of the sale the room erupted in applause and cheers. Francis Bacon’s triptych of Lucian Freud is a testament to the friendship between these two giants of twentieth-century painting. The work was executed at the height of Bacon’s career. Its intimate 14×12 inch format is one which the artist used exclusively for portraits of his good friends. “This striking painting has everything a collector in the current market is looking for.” commented Cheyenne Westphal, Sotheby’s Chairman of Contemporary Art Europe. “It is an artwork that radiates ‘wall-power’ with its brilliant colour and dramatic brushstrokes. It narrates one of the most impressive artistic relationships of the 20th Century between two titans of British Art and is desirably fresh to the market having remained in the same collection for almost half a century.” Bacon and Freud met towards the end of the Second World War and soon became close companions. They were at the vanguard of post war British painting and, with Ben Nicholson, represented Britain at the 1954 Venice Biennale. This friendship is apparent in the present work with the paint brushed, smeared, flicked, and thrown to create the remarkable likeness apparent in this portrait. “The stars align in this powerful portrait, which unites two pivotal figures of the Surrealist period and ranks among the finest Surrealist portraits ever painted. The record price it achieved reflects not only the desire and hunger for masterworks by the artist, but also the mythical status this work enjoys in Dali’s oeuvre,” said Helena Newman, Chairman, Sotheby’s Impressionist & Modern Art Europe. The work was painted during the summer of 1929 spent with Eluard and his wife Gala, who became the Dalí’s legendary, life-long companion and muse. Displaying the untamed imagination and technical virtuosity of his early Surrealist art, this work marks a major turning point for the young artist which was to change both his private and artistic life. 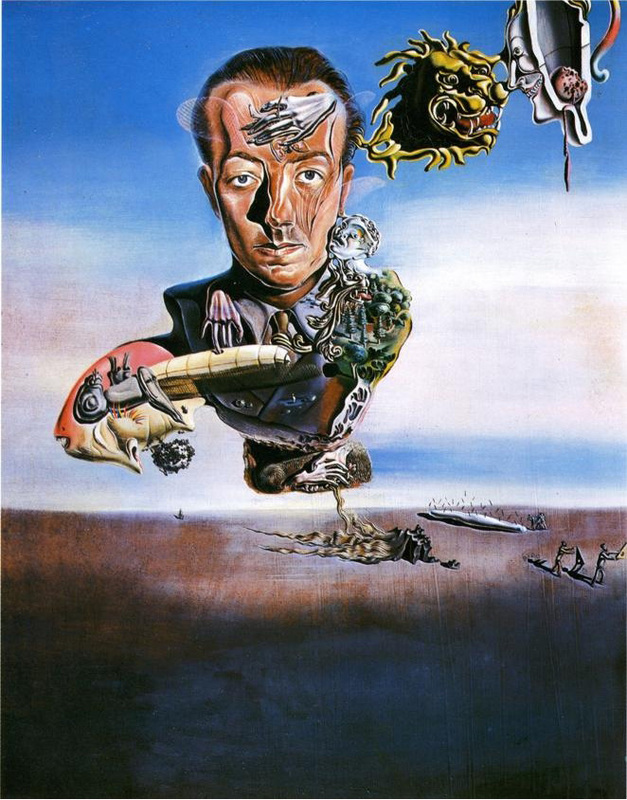 The portrait was shown at Dalí’s first exhibition which was accompanied by a catalogu e prefaced by André Breton. The exhibition proved to be a triumph and marked the beginning of Dalí’s public success, propelling him to the forefront of the Surrealist group. The world auction record was broken twice in quick succession tonight for Julio Gonzalez as two remarkable, rare sculptures by the artist soared above estimate. Masque My, sold for £2,729,250 / $4,390,817 / €3,219,145 eclipsing the previous record for the artist by a good margin. Soon after, a second work by the artist, Masque ‘Ombre et Lumière’, nearly doubled the record established just moments earlier, selling for £4,633,250 / $7,453,973 / €5,464,909. Both unique sculptures were executed in iron, the most desirable medium in Gonzalez’s oeuvre, and both were in exceptional condition. Jean Fautrier’s Corps d’Otage (circa 1943) set a new auction record for the artist, selling tonight for the sum of £2,505,250/ $4,030,446 / €2,954,938, over double its pre-sale high estimate (est. £700,000 – 900,000). This masterful work is one of the most significant paintings by his hand ever to appear at auction and epitomizes the height of Fautrier’s career. It was central to the artist’s breakthrough exhibition at Galerie René Drouin, Paris in 1945 and will be included in the forthcoming Jean Fautrier Catalogue Raisonné currently being prepared. Wols’s Sans Titre (1946-1947) – a very rare appearance for a work by the artist at auction – set a new auction record for the artist when it went for 17 times its pre-sale high estimate for £2,617,250 / $4,210,632 / €3,087,041 (pre-sale est. £100,000-150,000). The work, one of only 40 to have been created by Wols, epitomises the artist’s contribution to art history of the immediate Post-war period in Europe. Wols became, in a very short period of time, a leading figure in art in Post-War Europe and Sans Titre is a powerful marker of this pivotal reputation.